When we visit art galleries or learn about art in school, we tend to think of paintings on canvas, sculpture or photographs. Often these will be clearly recognisable as people or objects like food and flowers, and we can relate to them as familiar in some way. Art and pictures have been around ever since people first were recognised as human by historians, in pre-historic times. Prehistoric simply means history which dates before written accounts are available to study. The earliest humans did not have writing with which they could communicate and this means that art and pictures were even more important to them. 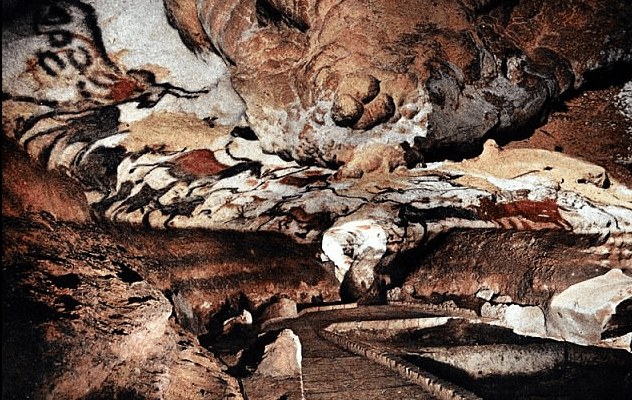 The earliest forms of picture art that archaeologists have discovered in Europe were found in a cave in France, called the Lascaux Cave Paintings, and are 15,000 years old. This puts them in what is called the ‘Late Upper Paleolithic Era’; the name given to the time span from 40,000 to 8,000 BCE (Before Current Era). Australia has very old cave art from 40,000 years ago, discovered at a site called Ubirr in the north. This is about the same time that the first humans were setting foot in the east of Europe, where they had travelled via Asia! All these types of artwork, whether carvings on rocks, paintings on caves or sculptures and jewellery, are forms of communication for the people of the time. 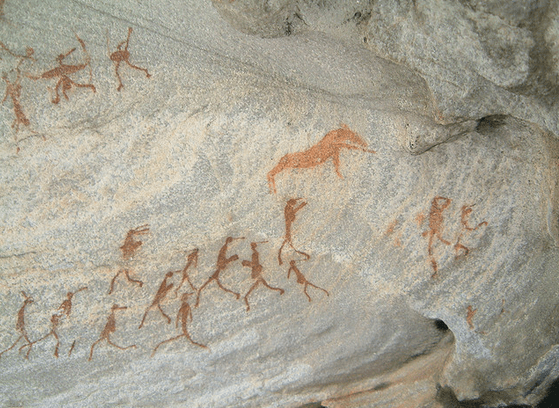 The cave paintings show hunters hunting, the types of animals they would hunt, religious or spiritual ceremonies and stories from their culture. Through this, we can learn what type of clothing they wore, what jewellery was important, and the types of food they ate and liquid they drank. Prehistoric art is more than entertainment and something nice to look at. It told people at the time what each group of people felt was important for others to know about them and what was important information to pass on to the next generation. For examples, pictures or carvings of hunters in action would tell the person looking at the artwork what animals were in the region that could be hunted and what weapons were best to use. They could even communicate what time of day or night and what weather was best to hunt in. Prehistoric artists didn’t have the tools that we have now. Paintings were done with hands, mouths or simple brushes, and in basic colours because the artist could only use what was near them in nature. Sculptures would use basic stone tools such as flints to carve shapes into and on stone. Jewellery was also carved out of stone, as no metal had been discovered that could be used. Art has been around as long as humans have, and like today, art is a great way to communicate and tell a story. As artists in prehistory would use their imagination, so do artists nowadays. Art hasn’t really changed, just the tools we can use to create the artwork. Even today we do hand-painting, and create on walls. I often wonder what prehistoric artists would make of graffiti. I think that they would recognise it as very similar what they themselves were doing! Title Photograph by Nick Brooks – Western Sahara project 2002.